A snowy week filled with … pneumonia, for my daughter. She’s on the road to recovery, but it wasn’t a week where I got much writing work done. Sometimes, when you’re anxious or worried or there’s too much going on, you need to step away from the writing. And that’s okay. I did do a variety of other things. For instance, Dating on the Dork Side is now wide! Actually, it’s the same size it has always been. What I mean is it’s now available (nearly) everywhere online, not just Amazon. It’s already up on the big retailers such as Nook, Kobo, Google Play, and Apple. So, if you’ve been waiting to grab a copy for your Nook, now’s your chance. In other cool news, Vellum can now format for large print. So I’m getting Coffee & Ghosts into large print. I’m also combining the three books into one set, for ebook and paperback, but not large print, since the three-book paperback weighs in at +800 pages! It’s a doorstopper. In audio news, I signed the contract for Coffee & Ghosts. More on that when it’s officially official. Right now, I’m pulling together some notes for the narrator. I’m very excited about this. That’s it for now. With a little luck, we’ll be able to return to our regularly scheduled writing and Girl Scout cookie selling next week. Oh, it was cold here this week. I think it got down to -29, without the windchill. And, yes, the only way to handle the polar vortex is to bundle up and nap. In writing news this week, I have the edits back for The Trouble with Necromancers. So I’m switching gears to work on that because the changes I make in the first book will naturally spill into the second. The changes I need to make? Ahem. I need to make sure the story in my head is actually on the page. To solve this issue, I asked myself: What if Poppy (the main character) knew something about the antagonist from the very start of the story? Here’s the thing about getting an edit. You don’t necessarily need to take the editor’s suggestions (although you may want to). You do need to look at the issues and address them in some way. Maybe that way is not to delete or change but amplify. A good edit helps you see your blind spots. In audio news, I think I’m a step closer to securing the narrator I want for Coffee & Ghosts. More on that when it’s official. It’s so very cold here, so very, very cold. And it’s going to get colder before it gets warmer. So we’re just going to bundle up here, read and write and hope for the best. In actual writing news, I’m making progress turning the novella into book two of the series. This isn’t a super speedy process, but it seems to be working, and I’m pleased. I also have some samples to review for the audio version of Coffee & Ghosts, and I’m so excited. I can’t wait to get the entire series into audio format. As I mentioned last week, the draft of The Trouble with Necromancers was finished, minus giving it some chapters. I’m happy to report I have done just that and sent the manuscript off for editing. Then I jumped right into organizing the expansion of the novella The Trouble with Doppelgangers into an actual novel. There are several threads I can weave into the narrative. I created a book map for the existing story, looked at where I could expand or add, and brainstormed three major plot threads. In this coming week, I will tackle … well, I’m not really sure what I’ll tackle. Something related to the novel, I’m certain. It’s a check-in with a cliffhanger. You’ll have to come back next week to see what I accomplished. Even though it’s 2019, I’m still rounding up some of my favorite things from last year. I didn’t discover podcasts last year, mind you, but I truly embraced them in 2018. I have a draft! Well, actually, I had one before. This is a draft that other people can read. Or will be as soon as I add in the chapter breaks. But wait! Doesn’t it all ready have chapter breaks? This is an odd thing I do. I write in scenes. Once the story is done, I look at what I have and figure out where I want the chapter breaks to fall (usually on some sort of cliffhanger). So I need to do that, get the manuscript into the proper format, and send it off. In other news, the Dating on the Dork Side promotion went very well. As a lovely bonus, author Allison Rhodes featured the book on her website, in a post that highlights what she loves about the first page or so. It’s a cool feature on her blog, and if you’re a writer, you might want to check it out. And … Prolific Works saw fit to feature In a Manner of Speaking as well this week and created a spiffy graphic for it as well. If you haven’t grabbed your free copy yet, head on over. But I warn you: this is most likely the saddest story I’ve ever written. I am charging through the read-through of The Trouble with Necromancers. Once that’s done, and I do a quick check for grammar and typos, I’ll send it out for editing. That makes now a good time to review 2018. 2018 was a strange year, for so many reasons. For me, one of the main ones was losing my good friend and writing BFF, Darcy Vance (you can read my tribute to her here). She died about a year ago, and navigating my creative life without her has been difficult. For a bit, I thought I would stop writing altogether. I didn’t, obviously. Darcy wouldn’t want me to. Still, this year was full of me trying to find my way again, on my own. Writing. Eh. Not as much as I wanted to or would have liked. That being said, I started the year with an unfinished, very thin draft of The Trouble with Necromancers, and I ended up with something I think/hope works as a series starter, along with ~six books planned. I switched gears early in the year. I was thinking of focusing on a fairy tale series, but the world building wasn’t there. I switched to a contemporary story because that would be “easier” (ha, ha). What I think happened is I learned a lot about building a series and world from scratch. I also wrote a novella (soon to be a full-fledged novel) in the Tea & Sorcery series. I also had the chance to write a story that takes place in one of my favorite series. The author extended the invitation, so essentially, it was fan fiction. It was also a lot of fun to do (and necessitated rereading the entire series, of course). I’ll let you know if/when it’s published. Submissions. I sent out 25 submissions this year. I didn’t write any new stories for the short fiction market, so most of those were either stories I haven’t sold yet or reprints. In a Manner of Speaking, which was a finalist for the Portal Prize in Speculative Fiction. The anthology with the story will be out this year. I’m still waiting on a handful of 2018 submissions as well. Books. I published one book, Straying from the Path. This is my fairy tale compilation, and I was so certain I’d follow it up with more fairy tales. And … someday I will. What I did do this year is rebrand all my offerings. 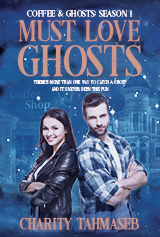 In doing so, I managed to snag a BookBub Featured Deal for Coffee & Ghosts 1: Must Love Ghosts. That was a big deal. That was a very big deal. I’m pleased I took the time and effort to re-do all the covers. It really made a difference in the next category. Money. I’m from the midwest. We don’t talk about money, at least not willingly. But in full transparency mode, how is this indie publish thing working out for me? Pretty okay. This is the second year in a row that I’ve made five figures. Not living-wage five figures, mind you. Still. Enough that this is certainly worth my while. Plus? It’s fun. More books, new books, new formats (audio, large print, and so on). But especially new series and new things for people to read. That’s really been my goal all along: things for people to read. Let’s see if I’m up to the task in 2019. Weekly writing check-in: third draft! Just a quick post–and a day late–to say that I now have a third draft! I used all my free writing time this week, my blogging time, and time I’m not sure I really had to do a deep dive into the manuscript itself. I ended up in another one of my Jo March writing tears. Although without the hat. I really need to get a hat. More next week. I hope to recap 2018, such as it was.